Over the years, there have been many changes in style, technology, and function of windows. When deciding whether to repair or replace your existing windows, begin by considering their age and condition. Tighten the seal around the windows with weather-stripping. There are many different types of weather-stripping available for use on wood, metal, aluminum, and vinyl. One of the easiest to apply is caulking cord which comes in a roll. You simply press the cord into place to make a tight seal. Every window not made of insulated glass should have a storm window. If your home has storm windows, ensure they are in good condition and install them properly before the cold season begins. When those icy winter winds start blowing, both you and your pocketbook will notice if your windows offer good protection. If your home doesn't have storm windows, or they are in poor condition, you can get as good or better protection using heavy-gauge clear plastic sheeting. Seal it tightly over your existing windows and you will have an inexpensive and effective alternative to storm windows. If a window develops ice or a frosty glaze inside a window pane, poor ventilation or insufficient insulation may be to blame. If you feel a cold draft in the winter or a warm draft during the summer when sitting near your window, it is a clear sign of poor insulation. This problem can significantly increase your energy bill. If you stand inside your house with a candlelit near a window's edge and the flame flickers or goes out, your weather stripping may need to be replaced. If your window no longer remains open on its own, requiring you to prop it open, it is no longer in good condition. If your windows become fogged with condensation there may be a seal failure. Seal failures are usually fixed by replacing either the glazing or the entire window. Modern windows not only beautify the appearance of a home, but they also bring sunlight in during winter, while preventing the warmth created from escaping outdoors. Windows also insulate a home from heat during the summer and keep cooled air from escaping. Today windows combine science and technologies that increase energy efficiency and actually reduce heating and air conditioning costs. Replacing existing windows with more energy efficient models doesn't have to be done all at once. Begin by replacing the ones causing the most heat loss, such as the large picture windows in your living and dining rooms. Replacing windows in stages over a period of years costs less up front and still increases energy efficiency. Common window types include: double-hung, casement, stationary, awning and horizontal sliding. They may be made of wood, aluminum or vinyl or a combination of these materials. 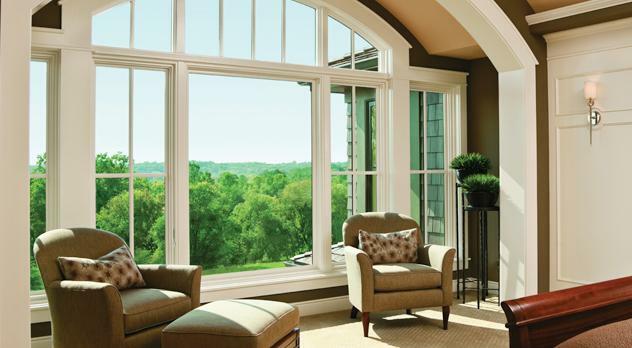 Almost all feature insulated glass and easy-to-clean designs that provide tight seals and eliminate heat loss. Whether you plan to install new windows yourself or have them installed professionally, be sure to visit a number of suppliers and study the various products and options on the market. You want to select windows that complement the appearance of your home, increase energy efficiency and give you the most value for your money. Quality installed replacement windows will give your home protection from the outside elements and provide a great overall aesthetic look from the curb while meeting the energy-related requirements required for rebates and tax credit programs.